This year I'm on a different team, competing against Robin instead of racing with her. Robin has Leonie, Liesbeth and Kevin on her team and I have Ellie, Karen and Desiree on my team. It's a special team this year because it's the FCA Endurance Auburn Huddle Team. I'm excited to have an FCA sports ministry huddle here in Auburn thanks to Desiree starting it. The big excitement today is the weather. Pouring rain and high winds. Last night at the pasta party at our house it was great trying to strategize what to wear with all the runners. Most concerned of course are the marathoners. We had 5 of us running the relay, 4 marathoners, and Helen Barker, running the relay as a 1/2 marathon. I drop off our lead-off runner, Ellie, at the start and feel bad for her having to run a mile in the dark, with blowing, pouring rain, protected with a trash bag. But she was a trooper and did great. Robin was also dropping off runners. I take the kids to the start of the 2nd leg (with Robin following) and then buddle up in rain gear to warm up for my run. It's howling out here! I have to lean into it just to jog. Surely this will add 20min to the marathoners' times. This is the toughest conditions I've ever seen here. Then I see the first runners. Wow, they don't seem fazed! The lead guys are only wearing singlets like usual and some aren't wearing shirts at all. Pretty tough for the pelting rain conditions. The kids hold their umbrellas while Robin and I wait for our teams. This is a competition and we're both hoping our team arrives first and that we can keep them in first. We see Michael Cook, Lee McKinley, and Rich Alesci all go by doing great. And there she is, Ellie from my team! We make a good hand-off of the chip and I'm off. Adrenaline rushing. It's not cold, just super wet. I'm running fast when the wind dies, but slow when it drives. The Relay always makes me run fast. Mile 1: 6:40. My hamstrings are sore, probably over exerting, so I try to relax and still have efficient pace. Many marathoners are pacelining to dodge the wind which is smart but I'm going a little faster so have to stay to the left, in the open. Mile 2: 7:14. My slowest mile due to the hamstrings but they are loosening up. 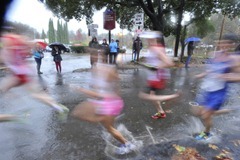 I'm amazed at each marathoner I see. Some are running the same speed as me. All are doing so well and not dismayed by the weather. Cups at the aid stations are blowing all over the place. Only a few bands are out under tents and are hard to be heard. Mile 3: 7:07. I'm doing better and hoping to get up to the 3hr pacer and see Rich somewhere. I ran 42min at the Turkey Trot 10k a couple weeks ago and am shooting for that pace today. There are rivers of water going across the road. The water is also running down my shirt like a shower. The Nike gloves are working great and the bare legs are fine. I have a wool cap and the only problem is keeping the rain from pelting my eyes. 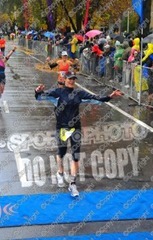 Mile 4: 6:42. . God is blessing my run and I'm thankful everything is going well for how crazy the conditions are. A couple hills. I try to fly down the descents and just power up the hills while keeping my eyes low. I thought I saw Rich Alesci up ahead (turned out he was way ahead actually). Mile 5: 6:33. Ran through the cute village. The school band was playing under the eaves. Pushed hard this mile.. my fastest yet! I'm down to a 6:51 average. Mile 7: 6:37. Now there isn't much difference between my pace and the marathoners. I'm almost at the 3hr runners. I hear loud music ahead. It's chanting of "hare krishna" or something. Really annoying, just over and over for a whole mile. But now I'm close to the exchange. There's my TeamMate, Karen Nickel. She's in perfect position, and ready with a smile and pigtails. I give my last surge and am glad to stop and let her exchange the chip. We're at 1:31. 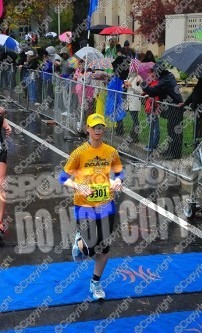 My split was 50:49, a 6:46 pace, close to my 6:42 pace at the 10k! "Have fun, Karen, and God Bless you!" She's off and my job is done. I jog back, still feeling the warmth of the excitement going through me, and see Robin coming down the road. I cheer her on as she hands off to her teammate, Kevin. 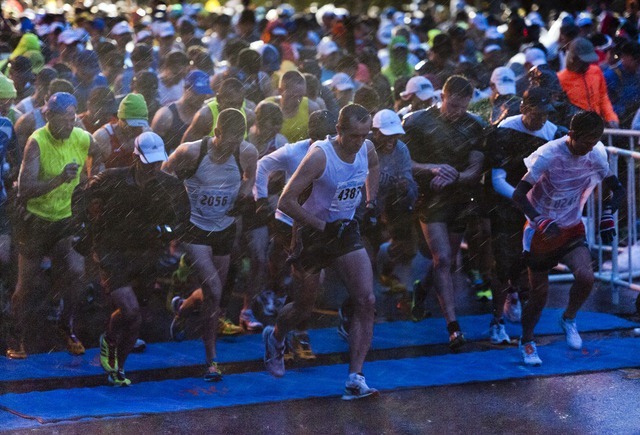 We head to the finish and watch our teams and all the marathon studs finish. I was amazed to see such good times even with the wind. Rich did a 3:07! Our team did a 3:17 for 2nd place which was exciting for all of us. And we stayed ahead of Robin's team. The sun came out afterwards. It takes a real storm to make the sun look so glorious. Similar to hardships in life to make the blessings so much more wonderful! Thanks, God, for everything! Karen and Desiree Bringing the Team Home! This year, Troy and I are on different relay teams. I “kicked him off” my team so that my college roomie, Liesbeth Magna, could have her hubby Kevin on the team. Troy is on a really great team with our new Auburn FCA Endurance huddle gals. In fact, they are going to be tough competition! I got to drive a bunch of friends to the start of the marathon: Jessica Bonner, Jim Kepfer, Kayden Kelly & friend, Michael Cook. Later my teammate Leonie and her husband Rich join us in the car. They keep cover in the car as the storm rages outside. It is fun until it is time for me to go and car battery is totally drained! I had left too many things running for the 45 minutes we hung out. Instead of looking to the Lord for help and peace, I start to panic and call Troy (he had just dropped off his relay teammate Ellie and was heading to the next leg). But then I feel God's peace. I ask a guy in a mini Copper, waiting to drop off his wife, to give me a jump. Amazingly his little car is able to get my mini-van going. “Thanks so much, God Bless you!” I take a moment to thank the Lord and remind myself that He is most important today. I’m on my way to the first exchange, yeah! The rain and wind are non-stop. 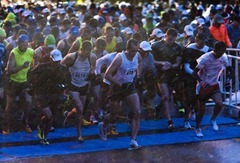 I feel for the all the runners starting right now! I decide I’m going to wear my plastic bike jacket. I’d rather stay as dry as possible and risk getting too warm and having a slower time. After 2 bathroom stops on the way, I meet Troy at our secret parking spot just as he finishes his warm-up. The girls are gearing up to get out of the car and walk to the exchange as I head out for my warm-up. When I return the girls and I are ready to go. We walk to the street just in time to see the first runners. Wow, these guys are wearing very little and a few guys are shirtless! The girls come soon after and they also are dressed light. Our girls are not digging this weather. Usually the rain is fun but not today’s storm! I take off and it’s tough from the get-go! I don’t feel very strong enough today to go sub 7min pace so I try to keep it as close to that as possible. Within the first mile I see a big group of runners. That’s got to be a pace group and sure enough I see a 3:35 sign pop up…that’s my neighbor, Tim Twietmeyer's group! I catch up and wave as I go by. “How’s it going” he asks. I give him a thumbs up and tell him “great job”. Now, I’m keeping my eyes open for the 3:30 group which shouldn’t be too far I hope. The wind is really relentless. Going through my first aid station, cups are flying everywhere and are not staying on the tables. I don’t know how these volunteers do it! They seem to be able to give out cups to everyone with smiles despite the chaos. I wish I could thank them properly! 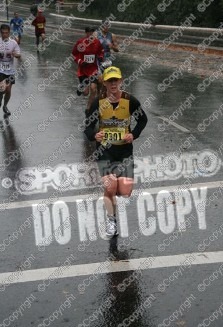 I continue to move past marathoners. I try to get as much as a draft from individuals and small packs as possible as I move along. I see a girl wearing a jacket from this year’s Boston Marathon. 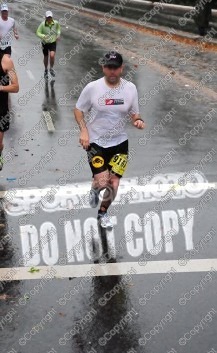 Boy, going from the year’s hottest race to the year’s wettest/windiest…amazing! By my third mile I do not see the 3:30 group. Man, where are they?! Should it be this hard to catch them? My pace has been hovering around 7:20 which is decent for these conditions. I am amazed that my search has distracted me from the chaotic weather. My jacket has done a good job of prolonging getting wet…but now I can feel it working it’s way throughout my shirt. The spectators are amazing! I am surprised by how many are out here! By the time I hit my 5th mile I can see a big group ahead. This must be them! Finally I catch up and see the pacer with the 3:30 sign. If it took me this long to catch this group, the 3:25 group will be way harder! I can hear some sort of music booming ahead but after several minutes I don’t seem to be getting closer to it. Then I can make it out as a chant “Hare krishna,krishna, krishna”. I start singing “Jesus, Jesus” in my head and thank Him for saving me…because nothing other than Him can save me and give me eternal life. Less than a mile to go, hooray! The wind and rain continues to pound and I am anxious to stop! I feel a little wimpy for that since these marathoners are trudging along with no complaint! I see Troy ahead and he waves and runs off to tell Kevin I’m coming. I see Kevin and make the exchange. “Go Kevin!” I find Troy and we hug. So glad to be done! Our team did great and I found out some very special news from Liesbeth and Kevin! Team Magna Brings Our Team Home!